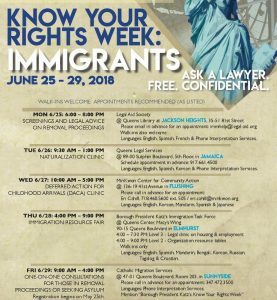 Borough President Melinda Katz and her Immigration Task Force announced details of their upcoming “Know Your Rights Week”, a series of free informational workshops and confidential legal clinics for immigrants in various neighborhoods between June 25-29, 2018 throughout Queens, where immigrants make up nearly half of its 2.3 million residents. The week will consist of five events across Elmhurst, Flushing, Jackson Heights, Jamaica and Sunnyside. All services and legal consultations provided during the week will be free and confidential; appointments are recommended for most of the events, although walk-ins are also welcome at all events. People are encouraged to ask questions with immigration lawyers, experts and advocates, and seek guidance on the rights that immigrants are afforded under the law. Among the services offered will be legal advice on removal proceedings, clinics on the naturalization process and the Deferred Action for Childhood Arrivals (DACA) program, and one-on-one consultations for individuals. Mon, June 25 The Legal Aid Society will provide screenings for individuals facing removal (deportation) proceedings. Location: The Queens Library at Jackson Heights, 35-51 81st Street, Jackson Heights. Languages on-site: English, French, Spanish. Additional languages will be interpreted through a telephone interpretation service. Appointments: Walk-ins are welcome but appointments are recommended. Please email immhelp@legal-aid.org for an appointment. Anyone with an appointment should bring their Notice to Appear and any other immigration documents related to their case.